The Vedic Age is the “heroic age” of ancient Indian civilization. It is also the formative period when the basic foundations of Indian civilization were laid down. These include the emergence of early Hinduism as the foundational religion of India, and the social/religious phenomenon known as caste. This period of India’s history lasted from around 1500 BCE through to 500 BCE; that is, from the early days of the Aryan migration into north-west India through to the age of the Buddha. The Aryans were a people from central Asia who spoke an Indo-European language. They brought with them into India a religion based on the worship of many gods and goddesses. This ancient religion is depicted in collections of oral poetry and prose – hymns, prayers, chants, spells and commentaries – known as the “Vedas”. These were composed at around the time of the Aryan entry into India and in the centuries following. They were written down many centuries later, long after the “Vedic Age”, but much of what we know about this period of ancient Indian history is as a result of the faithful word-of-mouth transmission of the Vedas from one generation to another. The Aryan belief-system that the Vedas reflect was distantly-related to those held by other Indo-European peoples of the ancient world, such as the Greeks and the Germans. However, some time in the centuries before they had entered India, the practice of fire ceremonies of the god Agni had become a focal part of their worship, a trait which they shared with their near-relatives, the Iranians (the word “Iranian” comes from the same root as the word “Aryan”). Another leading god was Indra, the High God. Also, the concept of the “Cycle of Life” – reincarnation of the soul from one earthly life to another – also arose in this period. The Aryans came into north-west India as pastoral, semi-nomadic tribes led by warrior chieftains. Once in India, they settled down as rulers over the native Dravidian populations they found there, and formed tribal kingdoms. The different kingdoms were often at war with one another, and echoes of these violent times can still be heard in one of the greatest epics of ancient India, the “Mahabharata”, which has come down to us from this period of history. Another body of literature that was composed towards the end of the Vedic Age were the “Upanishads”. Originally, these were included in the Vedas, to which they formed commentaries; however, they were gradually separated out and assumed an identity of their own. The 200 sections of prose and poetry of which they are composed explore concepts only dimly perceived, if at all, in the earlier Vedas. These include the idea that the material world is unreal – indeed, it is an illusion. So too are Earthly emotions such as desire and suffering. To break the weary cycle of reincarnation which all souls have to go through, therefore, involves renouncing desire and other human feelings which bind the soul to the material world. This will allow the soul to be united with the “World Soul” (Brahma), and so achieve peace. These ideas helped to give the religious thought of ancient India a very distinctive flavour. They have influenced Indian civilization throughout its long history, right up to the present day. The Vedas, the Mahabharata and the Upanishads formed the foundational writings of the Hindu religion, which was gradually taking shape in the Vedic Age. They show that the ancient Vedic religion was evolving into something different. This was probably to a large extent the result of influences from the older Dravidian populations over whom the Aryans ruled. During the course of centuries the Aryan nature deities lost much of their importance, and three new gods took their place: Vishnu, the preserver; Shiva, the destroyer; and Brahma, the creator. The ideas associated with the Upanishads became important, and these had a profound effect on social life. The notion that every element of creation – humans, animals, plants, rocks and so on – had a portion of the World Soul dwelling in them (“Atman”) gained acceptance within ancient Indian society. With it came a respect for all living things. It was during this period of history that ancient India developed its distinctive caste system. The tendencies towards social division had been present ever since the coming of Aryans into India. As happened at many different times and places in world history, the conquerors set themselves up as a ruling class. However, unlike in other parts of the world, where the differences between the conquerors and the conquered gradually disappeared over time, in India they solidified in the form of divisions between the castes, between whom intermarriage was forbidden. The priestly caste – the Brahmins – were at the top of the social ladder, as being closest to Brahma. Below them came the warrior caste, the Kshatryas. Then came the Vaishyas, the ordinary Aryan tribesmen, farmers, craftsmen and traders. Finally came the Shudras, menial workers, the labourers, servants and those performing services which are ritually unclean. There were also many people outside the caste system altogether, excluded from Aryan-dominated society. These were called the “Untouchables”. They were not really regarded as human beings, and performed the most degrading tasks of all, such as dealing with human waste. 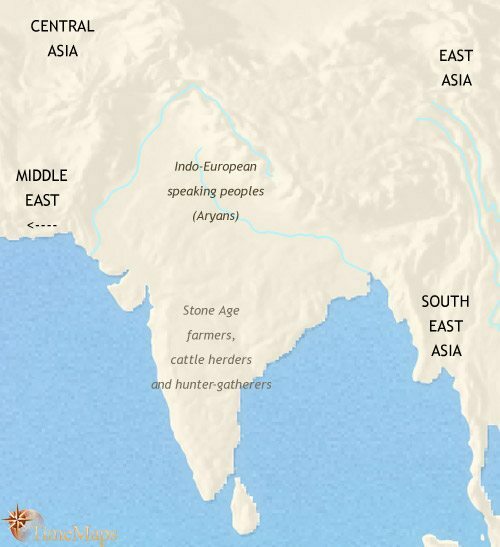 As the Vedic Age drew to a close, the tribal society of the early Aryans gave way to a more complex social organization. The use of iron spread form the Middle East from around 800 BCE. This made agriculture more productive, and populations grew. Trade expanded, both within India and with the lands to the west. From the Middle East came the use of writing, and the great oral traditions of Aryan society began to be written down. Organized kingdoms with centralised authority emanating out from the royal palaces arose in place of the looser, clan-based tribal states. Not just kingdoms, either; in some places, particularly in the mountain areas and on the fringes of the Aryan world (essentially present-day modern Pakistan and northern and north-central India), confederations of clan-chiefs arose which later generations have labelled “republics”. This makes ancient India the only place (as far as we know) in which the republican form of government flourished in the ancient world apart from in the Classical world of the ancient Mediterranean. The place of the Vedic Age in World History is as the period of ancient India which gave birth to Indian civilization – one of the great civilizations of the world. The fact that Vedic society gave pride of place to the priestly caste of Brahmins is directly related to the emergence of a religious culture which, in the following period of India’s history, would lead to the appearance of three distinct but closely-related religions – mature Hinduism, Buddhism and Jainism. Together, these religions claim the allegiance of billions of people in the world today.